Last Saturday I showed you a flashy male Cardinal and I thought I would show the delicate-looking female this week. They are so lovely in their soft tones of brown with a red tinge. She was picking around for seeds among grains of ice and salt along a walkway at the Sunnybrook Health Sciences Centre. Hello, she is beautiful. Love the Cardinals. Thank you for linking up and sharing your post. Happy Saturday, enjoy your weekend! She's a beauty. I do enjoy seeing your photos of the cardinals since they are so rare down here. At our previous house, we had several cardinal nests and it was always great fun to watch them. The female was very protective and smart...she knew how to lead a predator away from her nest, but fiercely defend the nest, too. She still looks plump enough to easily make it through the winter. So pretty and with those red tinges she is so fashionable! The wee bird is so pretty and very cute. 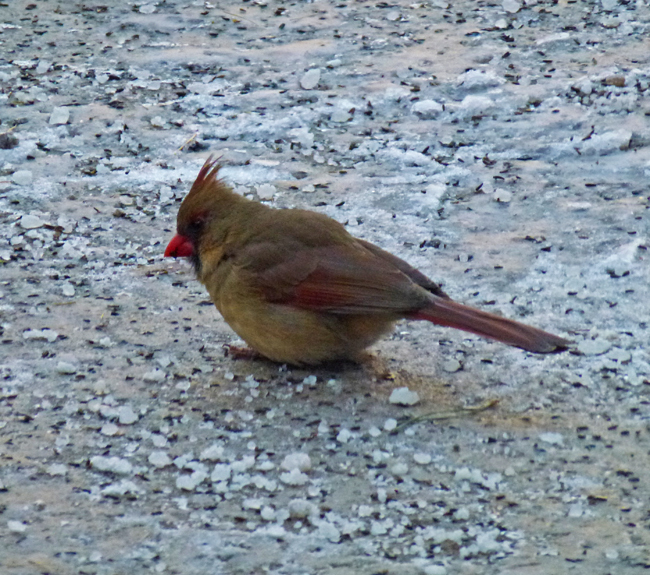 I love female cardinals. Of course, the males are flashier but the females are subtle and classy. Nice one Pat. It is remarkable how these creatures manage to survive our very cold winter temperatures. Es precioso. Que solito está Pat! !